I just read the entire thread. Great project! 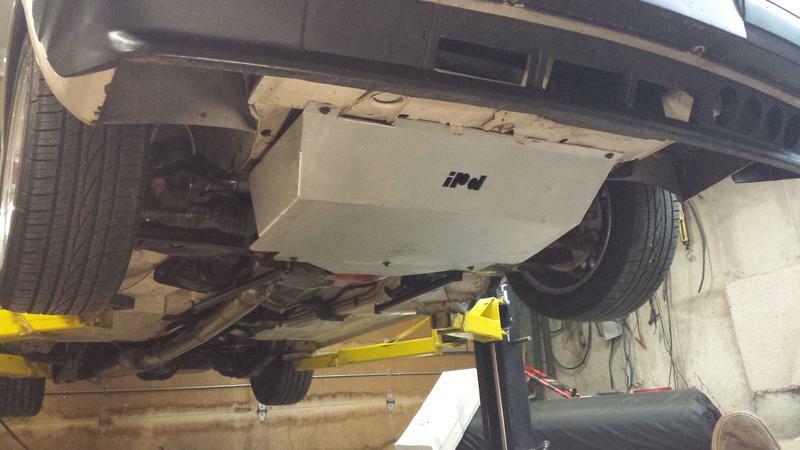 How do you think te paint will take the risk and sand under the car? I've been wondering what to cover the bottom of my car with. Thanks for the kind words. On the paint, I guess time will tell! So far so good, I will only be using the car during the nice months when the roads are clear which will help. Also it's enjoying indoor storage which keeps it dry. Otherwise I'm hoping it lasts as well as the paint anywhere else on the car. you can get clear stone guard too, which could be sprayed over existing paint, rather than the black stone guard that you would paint over. 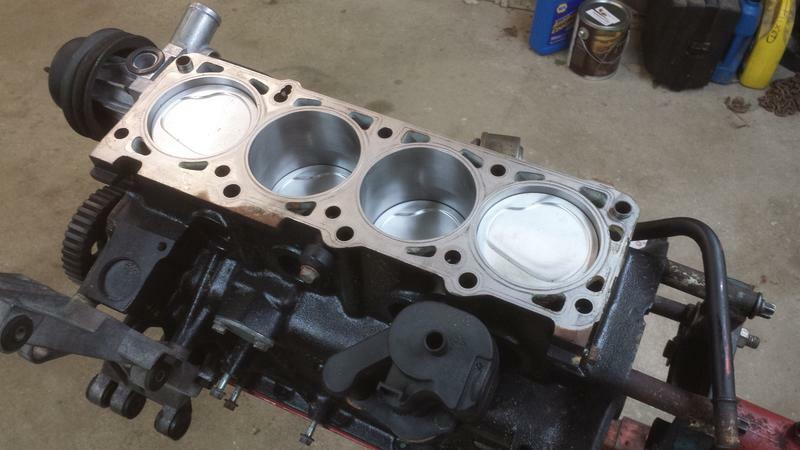 I had been wanting to start getting parts together to build a new engine for the car, and after kicking it around for a while I decided that if I was going to do a redblock I should do a 2.5 liter. I live in a good area for hunting boat parts so I spent a few months searching for extra displacement. I wanted a rear thrust crank, so it was a little tough to find the right year/model... especially since most were listed vaguely. 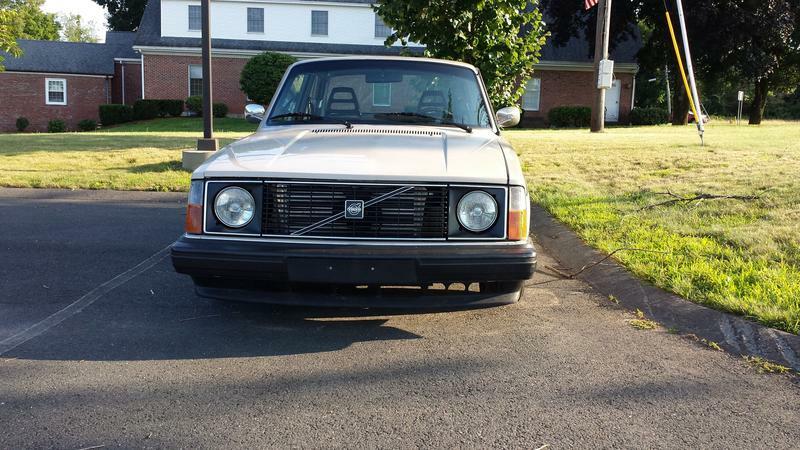 Eventually I found one on Long Island listed as a 1991 AQ151 with a 290 outdrive. 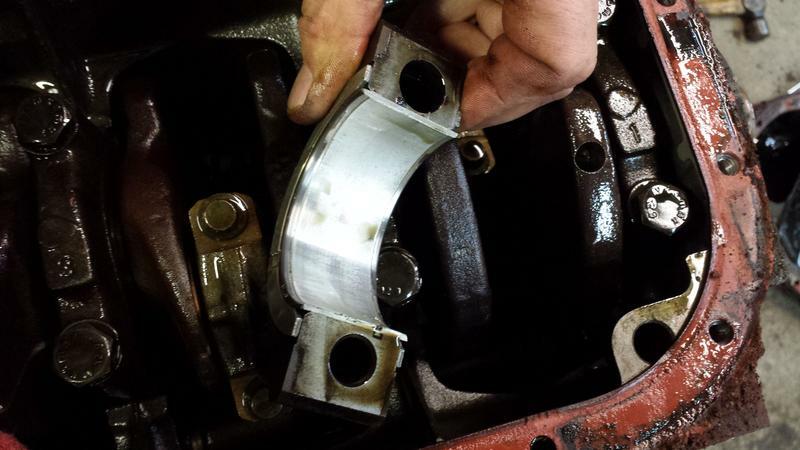 The build plate on the block was 250a, which according to the net should be rear thrust. The Buy it Now was $100 for everything so I just jumped on it and hoped for the best. Seller (who lived in a beautiful house) had it in his 23' fiberglass fishing boat and pulled it because it was underpowered (duh!) and "wasn't really running right". Nice guy, and I was getting a haul of boat parts for the money, so there was no risk besides wasted time. I tore it down the next day, little ugly but looked pretty good. I was really only concerned about the crank at this point, I figured the 531 was an unknown and if it was good it'd be a nice bonus. Thankfully the exhaust manifold came off without taking a chunk of head with it. 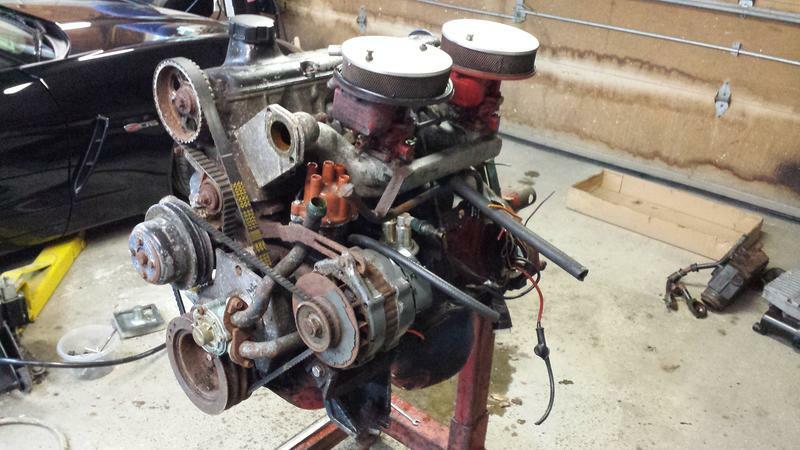 Considering it was a salt water engine the #4 port isn't in bad shape. 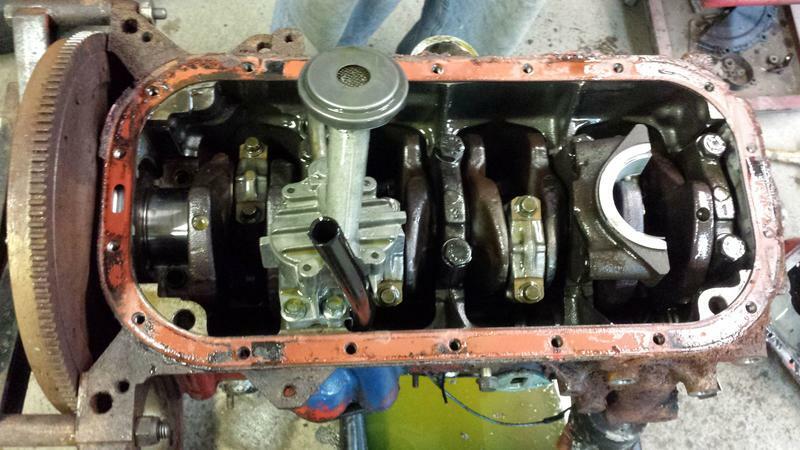 It has two Heli-Coil repairs and is a little pitty around the holes (most of what you see is unscraped gasket crud). 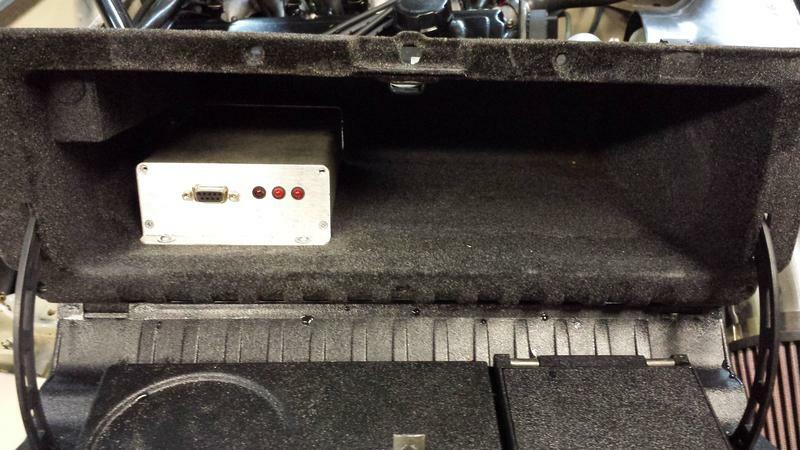 Looks like I should be able to get it tested, touched up and use it - nice! Notice it has an '89 build date, now I was really wondering. Popped it open and happy happy it's a rear thrust. Everything in the bottom end looked really good so I'm in business. 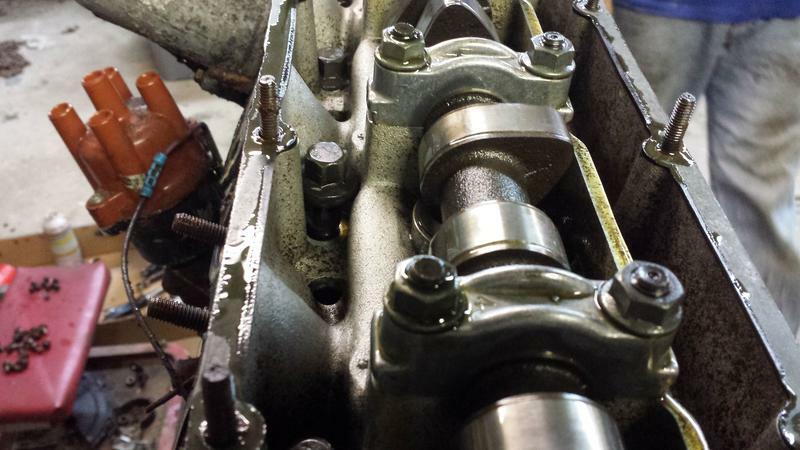 Head bolt was completely loose, all others were torqued properly. I'm curious when the boat had head work done last. The cylinders and pistons had some light scoring but not bad. 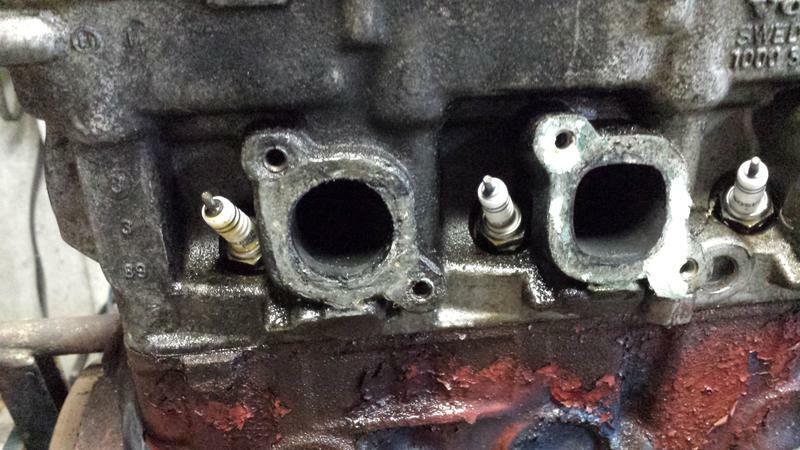 I'm going to get everything checked out at a machine shop, if they can clean the cylinders up easily I'll probably just use this block and drill it for squirters and oil return. 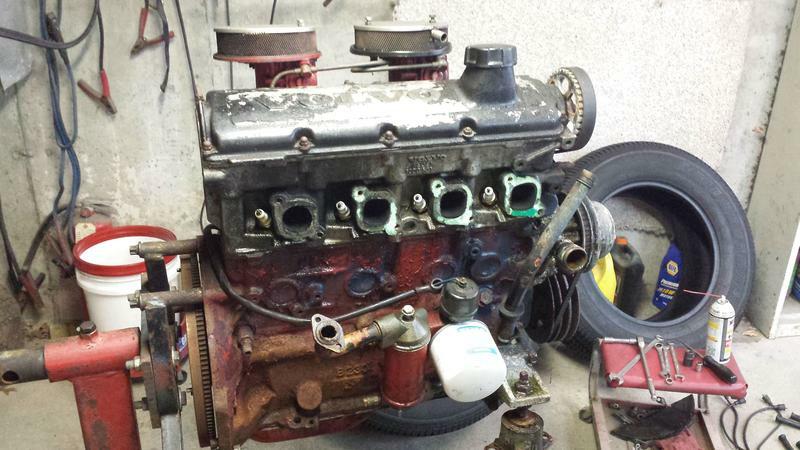 Need to get it sorted so I can get moving and find forged rods and pistons. The goal is to put the car back on the road next Spring with the new engine, so hoping I can make it all happen this winter. Besides that new side project I'm still trying to finish the car. I brought it to a local cruise night and got a great reaction which was really nice (and a stark contrast to what I got with my SAAB 900 10 years ago ). 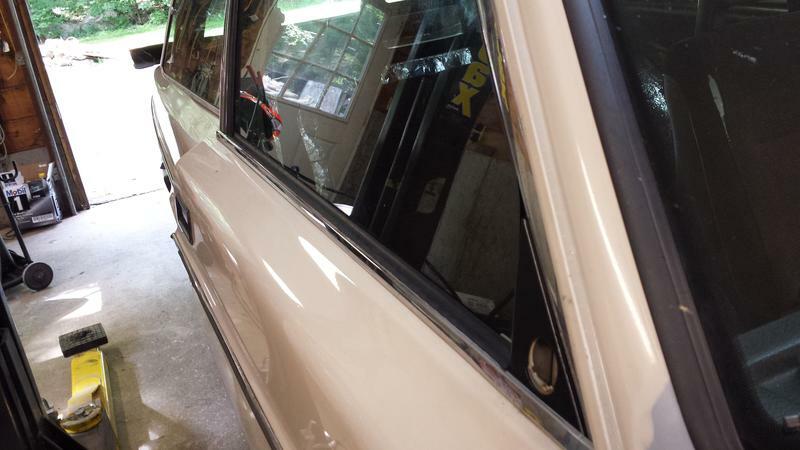 Picking away at the interior, I swapped over the power windows which are really nice to have. Still have a list of needs and to-do's... finding the set of seats I'm after is top right now. What I've got now is unbelievably uncomfortable and smell musty. 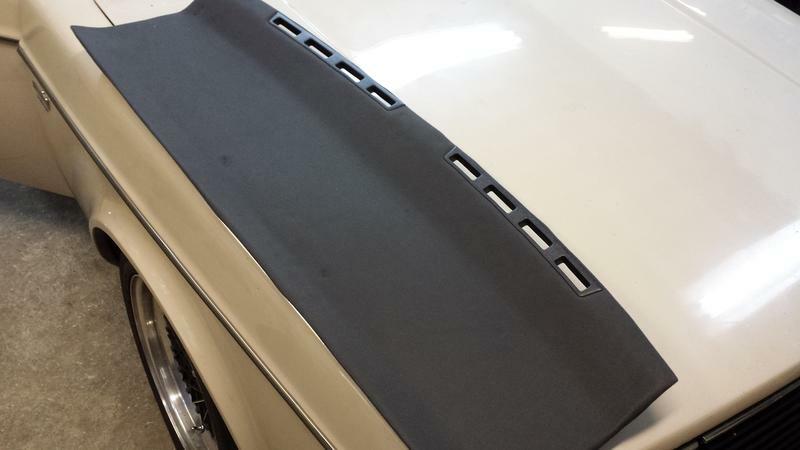 Re did the rear parcel shelf with the same material as the headliner. 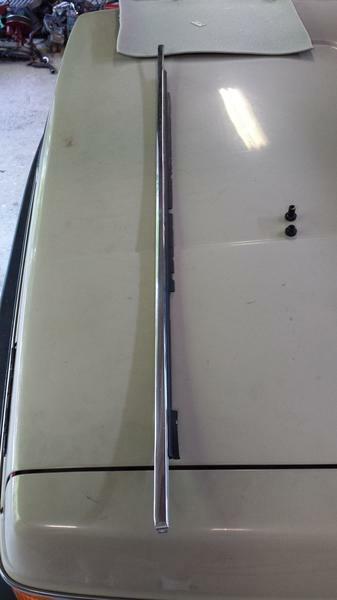 Replaced razor sharp window scrapers with nice new. Have gotten most of the interior panels back in and gave the MS box a better home in the glove box vs. the old clamp to the dash brace. The car was doing the civic bounce like crazy so I went back and put a little more compression and rebound back in. Huge improvement, will fiddle more but it's a lot more confident in the corners. I also lowered it a little bit (under half an inch) which seems good besides one smack to the lower chassis braces on a g-out I learned to drive around. Which reminded me I should get a splash pan on! boost controller - I have it on the shelf, and if I'm going to have a new motor next year it's easier to push it a little more. Car's parked for winter anyways! I wonder if there is a paint to black out the intercooler that won't interfere with it's cooling abilities. Paint it black! MCM says you'll get maaaad kilowatts. Well, I bought the car a present this weekend. I was ready to get started assembling parts and building the 2.5 when this block came up locally and I couldn't pass it up. Last year I went down to Paul/psac's to get the header, turbo and exhaust and this year I went back to get his motor. It's a fully built zero-mile 2.3 with RSI rods and Wiseco pistons, squirterized, o-ringed block, hardened crank, ARP head studs, all new bearings and everything assembled sparkling clean and new. 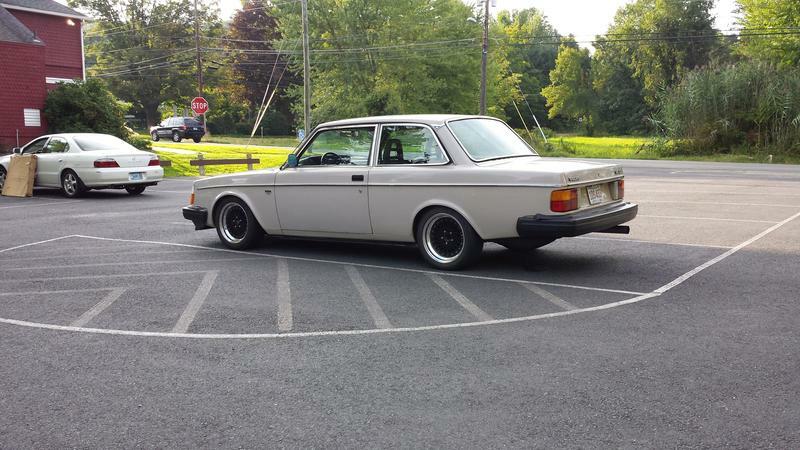 It's really impressive and a nicely done build, gaskets, water pump, pcv box are all Volvo oem - always a good indicator. Strip it down, scuff it up. 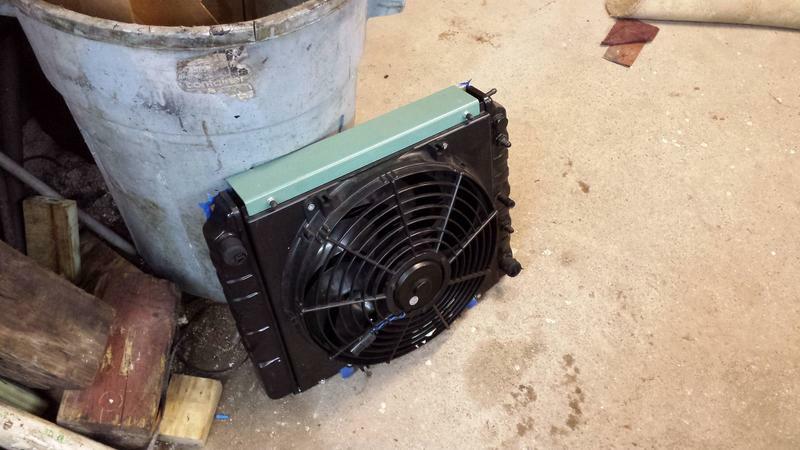 Also got from Paul a mint Nissens HD radiator and efan with a really nicely made aluminum shroud. If you recognize the color on the top piece this is another part from Jordan's old build to make it to the car. It takes a turbobricks village to build a car. Morning drives to work are in the 50s now and the car loves it, can't wait to turn up the wick a bit. 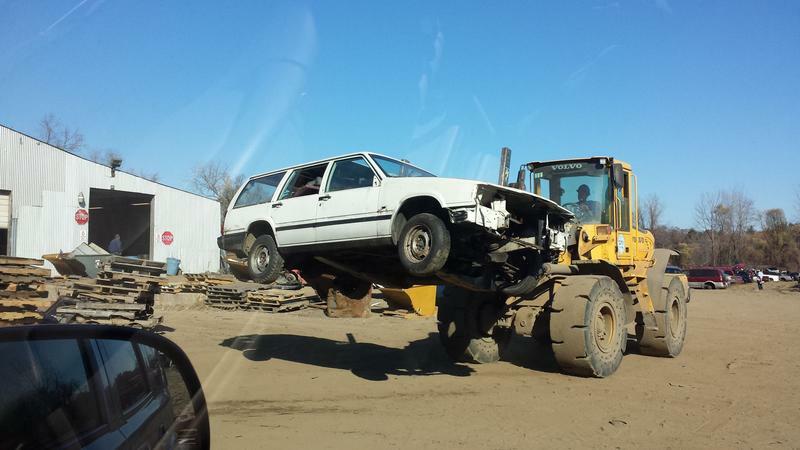 Do need tires though. Fantastic. Have I mentioned too many times that I really like this car? Great work. Love seeing your updates. Also, anodize the intercooler. I've thought a LOT about doing mine. Have I mentioned too many times that I really like this car? My friend, there is no such thing haha. Sure you understand it's hard for me to not just see all of the not-yet-done things, so every time someone likes the car I get excited. May end up doing something with the IC eventually, for now I've kind of started to like the little bit of showiness since it's only if you get it from the right angle. New tune from Kenny this morning and a 50degree drive in - car's running better than ever! How's the road notice with no undercoating? Thanks! It's hard for me to give any kind of before/after comparison since I did so much stuff in big chunks and never drove the car when it was "normal". But I did drive it some when everything was stripped and the inside of the car was bare and it made an absolute racket. Tons of noise from sand hitting the bottom of the car and resonating exhaust noise. The dampening/insulating I did inside the car made a huge difference in that respect, and road noise through the floors is minimal to not even noticeable. It's not as quiet as my 940 but it's really a pretty civilized car to cruise in (considering it's a pretty aggressive setup). After getting intimate with that undercoating I'd say that given the thickness of the layer and the shape most of it was in I'd be surprised if it was doing much at that point anyways. I know you have your shell all beautifully stripped to bare metal, so I will say it just looks wicked cool in person, and the nice clean surface under the car makes working underneath it a real pleasure. Good to hear. I figure I'll do the chassis on mine with heavy layer of clear rockguard which should dampen it down some while still being "body color". 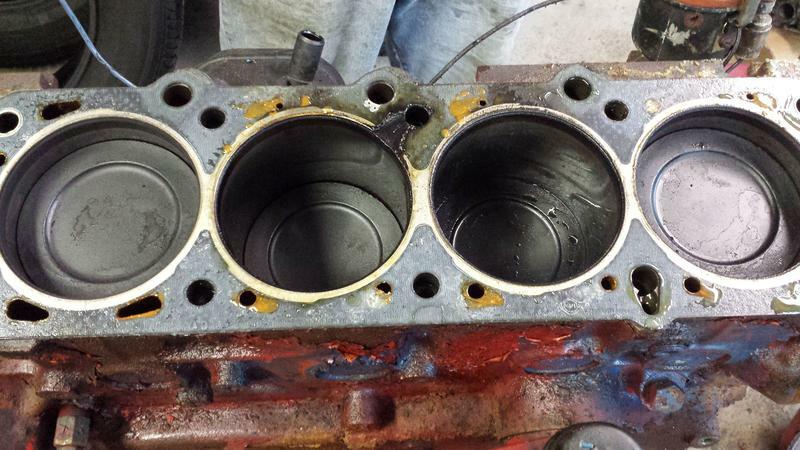 I love the pic of that nasty failed head gasket on the boat engine! Best of luck my friend. Glad to see it go to a great home and Awesome person. Better get some videos when your building real boost!! Thanks Paul. Glad it was still in the garage. We'll have to meet up in the Spring once I've got it in the car. I got the boost controller on yesterday, will start turning things up tomorrow. I bought a Hallman a while back and took the opportunity to overdue it a little and use -4 aeroquip stuff instead of vacuum lines. I'd like to change the intake a little and try to build some kind of airbox that brings air up from in front of the wheel. Plenty of stuff to keep me busy this winter. Nice score on the motor... Makes me a little jealous that I couldn't have found something like that for my 142. Anyways, nice to see it coming along so well. Where did you buy those AN connections with red and alu color? As I said before, beatiful build! 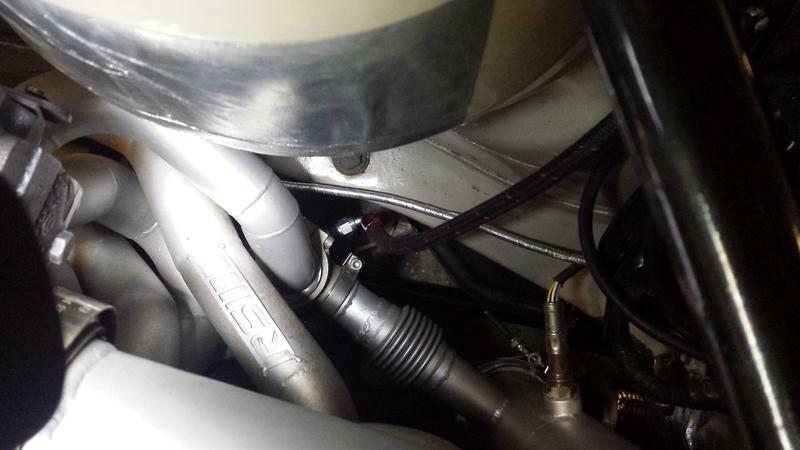 The fittings I just got from Summit Racing, they are steel Aeroquip -4 an (fbm1011 and fbm1031). I haven't noticed the natural/red finish until I looked for -4 stuff, so I'm not sure if they have it in other sizes. 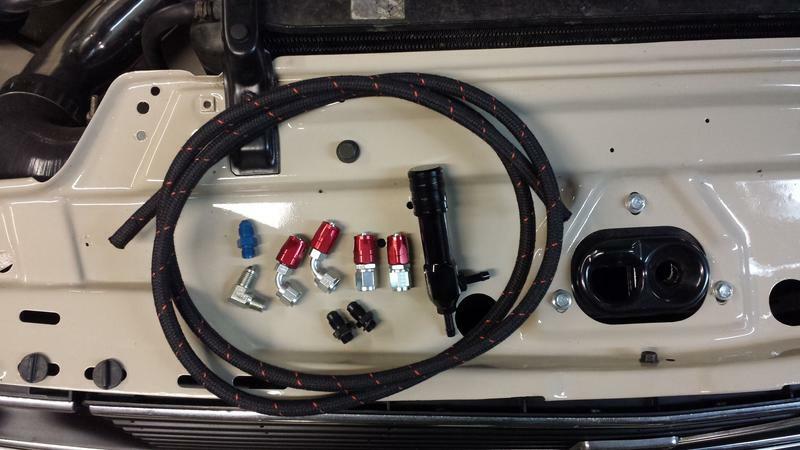 Nice stuff though, super easy to make the hoses with the nylon braided hose. We had a little car show at work last Friday for the first time. It was fun talking to some of the engineers here about the car, and I think a lot of them were surprised that the "business guy" was the real gearhead in the office. 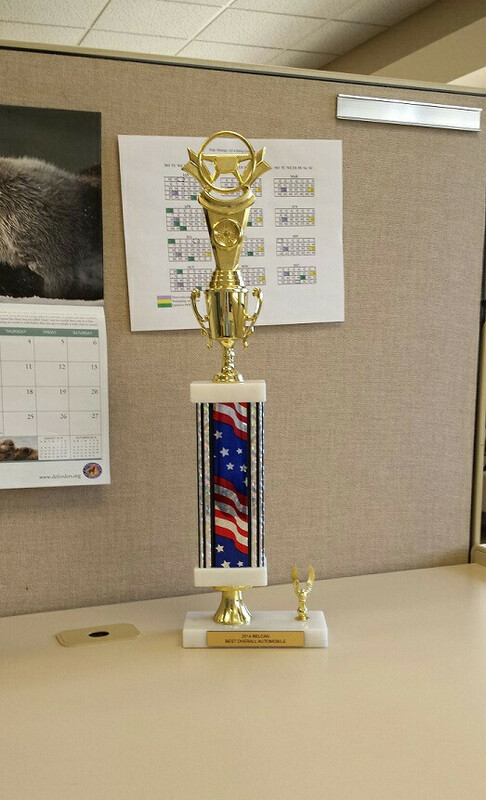 I was pretty excited when this morning the organizer dropped off the Best Overall award on my desk. Wasn't a real big show or anything but I'm still like a proud poppa to bring home a trophy for my little volvo. Nothing says "Gothenburg" like the Stars & Stripes! Warning, this is just a text heavy "think out loud post"
Past month has been the least I've worked on the car in a long time, but I'm driving it more than ever. I'm around 1,500 miles since it went on the road, and in that time it really has hardly missed a beat. Actually of the 3 cars I own right now the 242 has been the most reliable in the past several weeks (thanks SAAB 9-5 electrical issues and regina fuel pumps). I've been driving at 18-19psi and having a blast. Spinning the tires at the top of 1st and 2nd gear - a fresh sticky set should help. I have been driving around with the stock PCV box just hanging out open to atmosphere because I had kind of back-burnered finishing the system while I got distracted being a hooligan. It hasn't been an issue at all, besides being a bit smelly, until last week when I went for 20psi and drove the car really hard for ~5minutes. At some point it must have sucked up a gulp of oil and puked it all over the driver's side of the bay. Needless to say it made quite a mess and was a little shocking when I popped the hood. It's been fine since, but I need to get it plumbed to the intake so it's pulling a little vacuum at least. I was thinking I'll do stock PCV>Catch Can>Intake as the "real" setup. A little disapointing news from the machine shop after they checked out the 531 head from the boat motor purchased this summer. The head surface is pretty pitted, and the machinist said at least .040 to get it clean, which he quotes as roughly a 5cc loss in chamber volume. Since the 531 chamber is bigger, that would put me as 3cc smaller than a standard 530 head. I need to figure out what that equates to for a compression ratio, but not sounding good. The other option is to get it welded up, but that is going to really cost. Besides that, the #4 port which didn't look that bad is not level with the other 3. It has a round insert in the port, which I've seen on other heads but mine seems to be welded in - is that typical? Either way, it's going to take more welding and work to get 4 level ports and I just don't think it's going to pay off. It's kind of a shame I'm not actually going to use anything from the Penta motor, but I will be able to come out cash positive and with a 2.5crank to daydream plans for so it's not a loss. 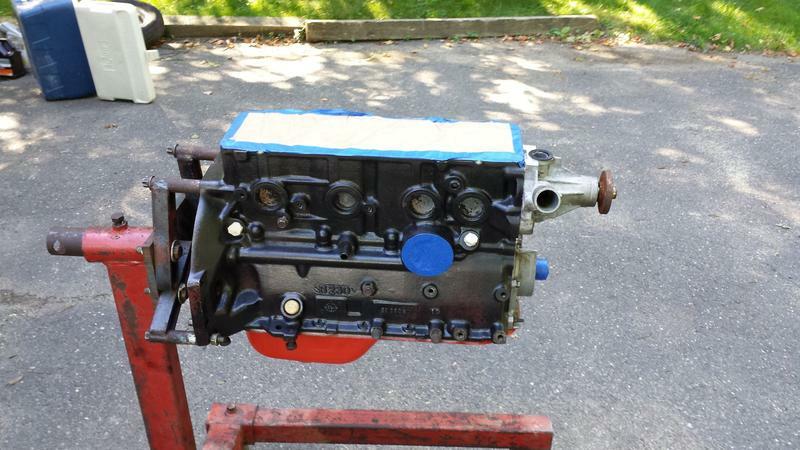 SO, new direction is to pick a good 530 off of one of my other motors and get one worked over a bit. I really don't want to dump a ton of money into a head, so I need to try and understand what work really pays off and doesn't require 4-figure machine shop bills. 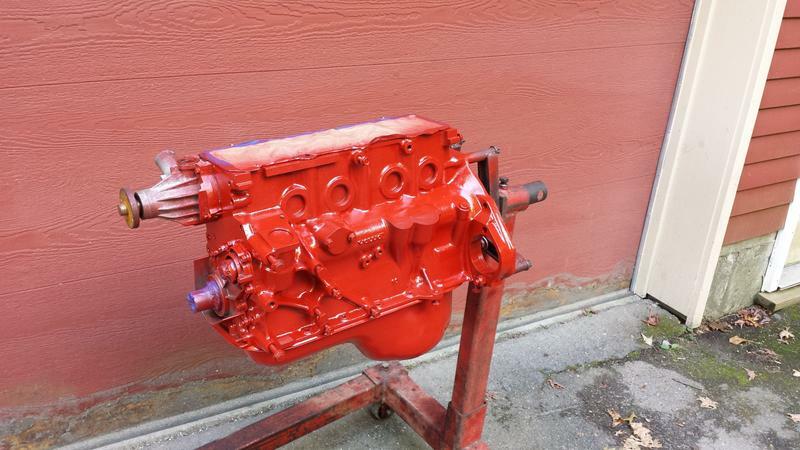 I don't need the flowingest 8v head on earth, but I am starting to look at this as a 350-400whp build so need the head to support it (and 7k rpm). I do wish we had better (any) options for larger valves and valve springs! - I'm going to be overhauling the whole Megasquirt setup. I'm planning on building a whole new engine harness for the car the right way, and ditching the stock ignition setup in favor of running 4 ls truck coils (right now thinking I'll run wasted spark triggering from the flywheel). I'm deciding between either modding my ms2 to do what I want, or buying a new Microsquirt setup because they are really nicely packaged now and would be more ready-to-go. I figure I can sell of the ms2 box to offset cost. I really can't wait to ditch the big messy hacked up lh2.4 harness. - I have a Nathan's fuel rail and Aeromotive 340 fuel pump that need to go in, so I'll be re-doing fuel line's in -6 at the same time. - I'd like to do the above and have it tested and proven on the engine currently in the car. That way things are setup and ready for me to drop in the built block and head. Figure that way I'm not trying to break in a new engine on an untested system. Once it's all setup I'd like to be silly and see where the limit of the stock engine really is. 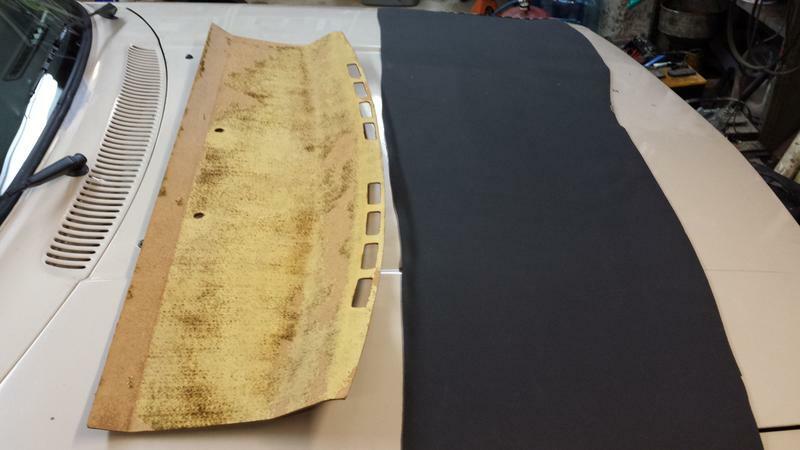 - Car needs to be wet sanded and polished, and I have a whole pile of new stainless trim that needs to go on, along with a set of excellent condition tails. - I'll be breaking the wheels apart and doing a proper refinish job, with new tires when they go back on. - I am still hunting hard for the right set of seats. I'm kind of fixated on Recaro Ls-b's so I'm trying to find a set from a VW either in the right color or something I can have re-upholstered. That will allow me to put my head down and really focus on finishing the inside of the cars. Door panels need to be done, need to get aux gauges set up, steering wheel etc. Decent amount of work left here but looking forward to seeing it come together. - That's the big stuff, then I can work on just refining it as a car, not a toy. So, lots to keep me busy while it's cold and dark. I've already started piling info and parts, so hopefully it can all be pulled off. I'd really like to have the car come out of the gate in ~May swinging with the new engine and ready to hit a dyno. Would be interested in hearing what people recommend for the head work. How much does it really pay off when you're just slamming 25+ psi into it anyways? I'm no expert in redblock head work, but I can offer some generalized thoughts for turbocharged engines. First of all the power goal is key, so you're on the right track with 350-400whp in mind. Secondly, increasing airflow potential through the head will help the whole system immensely. Let's say it takes 25 psi to reach your 400whp power target with a stock head, just as an example. 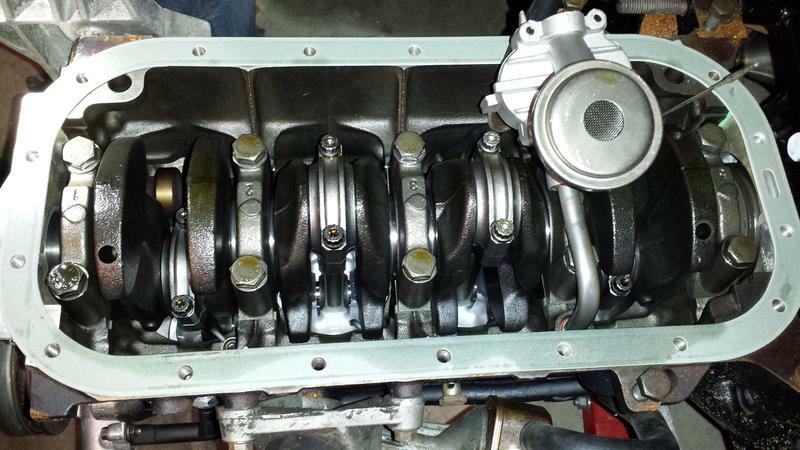 Head work and larger valves will then allow you to meet that power target at a lower boost pressure. Looking at a compressor map, as you increase boost pressure your pressure ratio goes up so the operating point moves up on the vertical axis. But in reality on the engine, the operating point will also move to the right. So increased boost pressure -> higher mass flow as well as higher pressure ratio. Until you hit choke flow for the system, where a change in boost pressure does not change flow at all, and the operating point is just moving up vertically. Once you reach this point you will see diminishing returns until you reduce restriction and increase the flow potential. Choke happens very quickly/obviously on a restricted engine like in rally. Back to reducing restriction: less restriction (i.e. higher flow potential) through the system means reduced boost for the same power. Less boost means you will likely be in a more efficient operating zone on the compressor map. Outlet temps will be lower, detonation threshhold will be raised, meaning you can go more aggressive on ignition timing. All else being equal, higher compressor efficiency means less shaft power is required from the turbine to drive the compressor. Therefore exhaust backpressure will be reduced, which will have the secondary effect of further increasing VE for the system. Meaning higher flow and more power. It's a snowball effect. Just because there's a turbo doesn't mean you should ignore traditional flow improvement techniques for NA engines. If your power goal is relatively low, you can leave the head alone in a lot of cases when adding a turbo (especially to a modern 4-valve engine). 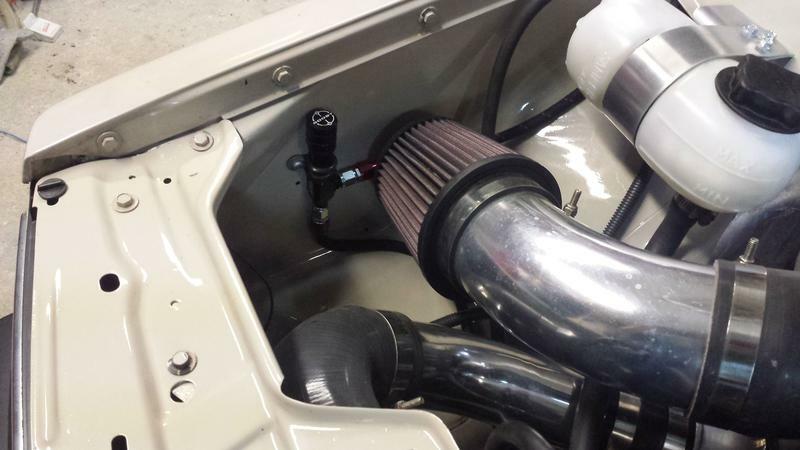 But once you start edging closer to the flow limit of your induction system including intake, ports, valves, and exhaust...then all of the traditional performance mods will help you make more power without overworking the turbo. Hope that makes sense. Get your Recaro's in and take pictures. I really want to see those in the car!